A few days ago I went to an Asian market here and once I got in, I was like a kid in a toy store. So many different types of foods, such colorful packaging, so many beautiful cakes, and my favorite, hundreds of types of noodles. I bought so many noodles, and I’ve been dying to start using them. Nothing like fresh noodles. Needless to say I bought a bunch of stuff, but there were so many things I had no idea what they were, and to top it off I forgot my glasses and couldn’t read any labels. Luckily, I did not forget my husband and he did pretty well in reading all the labels for me. I also finally got the new wok I’ve been waiting for weeks for and I couldn’t be any happier. Of course I had to test it out and I had just the right noodles for that. 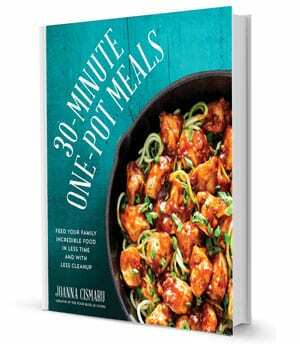 Which brings me to today’s recipe for Chicken Lo Mein. 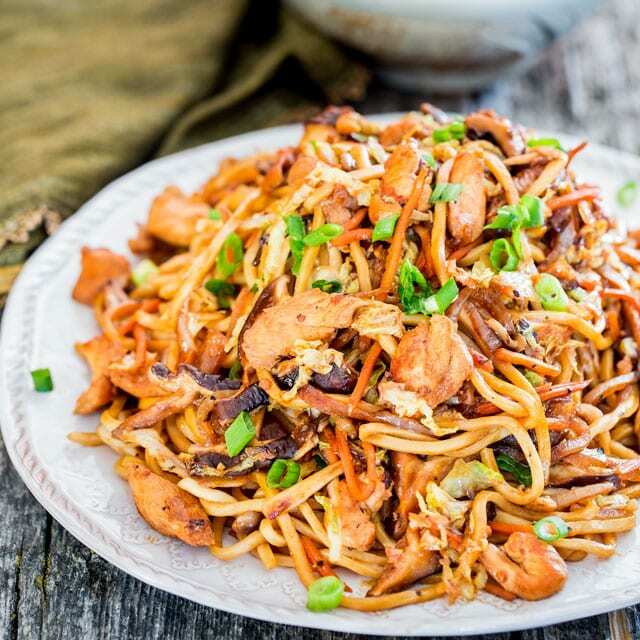 Lo Mein basically means tossed noodles and fresh egg noodles are normally best for lo mein. This is just my version, and it’s super easy and quick. You first need to toss together the chicken with a bit of soy sauce, some garlic and ginger. You could use chicken thighs as well if preferred. 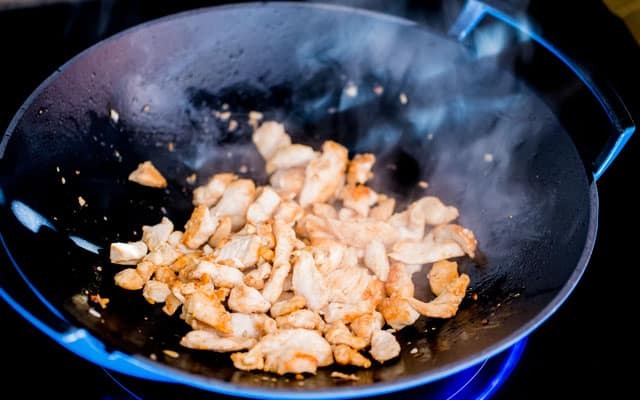 Add some olive oil to your wok and heat it well. Cook the chicken until it’s browned and no longer pink. The veggies I used here were shiitake mushrooms, Chinese cabbage, julienned carrots (I bought them like that to save me time) and a chopped onion. Use as many veggies as you want here, you don’t have to follow my recipe exactly. Cook the veggies for about a minute. Now comes the fun part, add the cooked noodles and the chicken back to the wok, then the sauce which is what gives this dish all the flavor. At this point you can turn off the heat and toss everything together, garnish with some green onions if preferred and it’s time to eat. This is what I love about Asian cooking, you spend more time prepping than actually cooking. Everything is cooked super quick. So there you have it, a popular American Chinese dish with fresh noodles loaded with veggies and chicken. Cook time includes time to cook noodles. You can also use chicken thighs instead of chicken breast. If you don't have hoisin sauce, you could replace that with a bit of barbecue sauce for that bit of sweetness. Oyster sauce could also be replaced with a soy sauce or fish sauce. What can I use instead of dark soy sauce? You can still use regular soy sauce instead. Absolutely delicious! We licked our plates clean!! Big hit with the whole family!! Do I need to use a wok? Hi Mike! Happy to hear this! 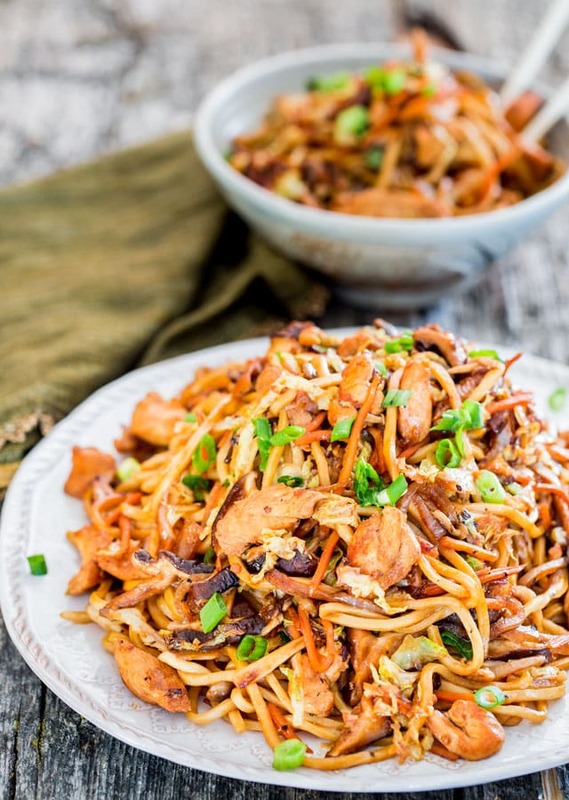 Would fresh Udon noodles be ok to use with this recipe. Loving all your noodle recipes, Jo. Yes those would be great! 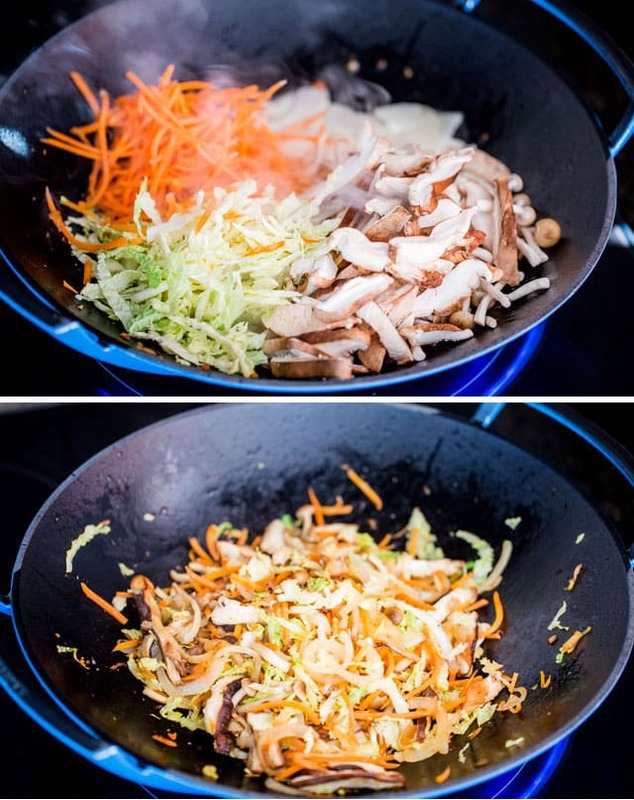 Follow the instructions on the package to cook them before using them in the stir fry. This came out really good. I have a vegetarian daughter, so I made it without the chicken, but have no doubt the chicken would have probably made it better. I followed the sauce exactly, but for the veggies, I bought a bag of Asian Salad Mix, added a can (drained) of water chestnuts, about a cupful of frozen peas and a couple of handfuls of shredded carrots (bagged). It took quite a bit longer than the 1 minute in the original recipe, but that was probably because I changed up the veggies. Sorry about the veggie changes, but I was in a rush, so took the easy way, which actually turned out really good. Oh! I also used on box of Barillas thin spaghetti. Thanks again for a recipe my whole family liked. This was delicious! 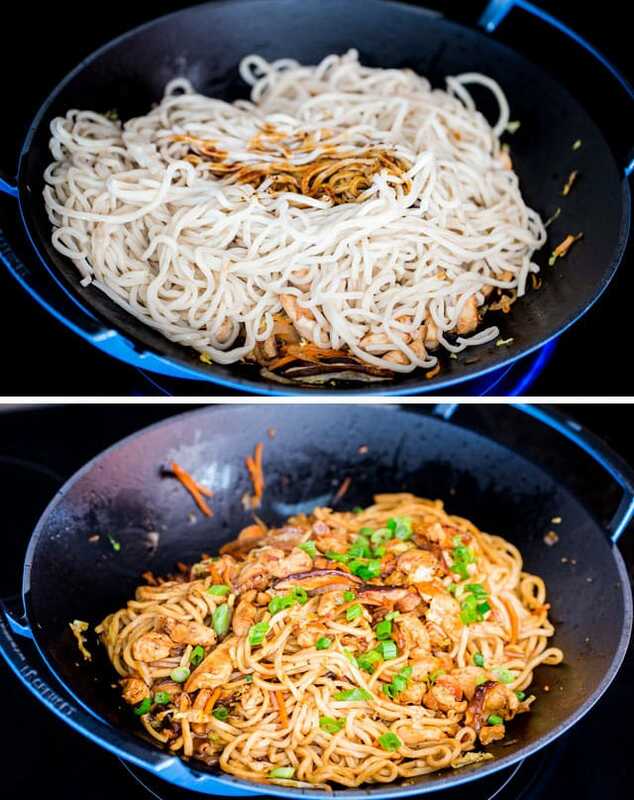 My husband loves lo mein, so when I came across this recipe,I had to try it! I was worried the onions wouldn’t be cooked enough, so I cooked them longer. It dirtied a lot of dishes and took me longer than 30 minutes to prep and cook everything, but the end result was worth it. (Plus, my husband cleaned the kitchen, so who cares, right?) Tasted better than a Chinese restaurant (not so heavy). It’s going in my meal rotation. So when you say ramen can that mean like the .25 cent ramen packs you buy in the store? Cause I have a ton and that would make things a lot easier for me. We don’t have an Asian food store here where I live. I want to try this recipie but all I have is spaghetti noodles and top ramen packs. You can use instant ramen! No problem. I’ve made this recipe regular for a year or maybe even 2? We love it! I’ve tried several before but nothing comes close to this, this is perfect. It’s so quick and easy that it is a weeknight favourite, and I have all the sauces stocked so it’s a decent grocery budget stretcher as well. I rav about this recipe to friends! Thanks so much! Thanks so much for sharing your recipes. They are easy and I love the way you explain the “history” of the dish. Although we hear the terms “bolognese” and “lo mein” many Americans aren’t familiar with the actual meaning. I make spaghetti Bolognese all the time. I love your recipe for the Aglio and Olio – my son-in-law is Italian and I don’t always remember what the dish actually means. 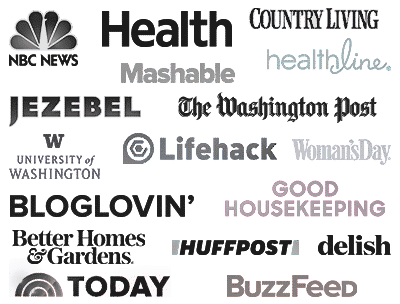 You’ve done an terrific (and easy!) job of helping us Americans know what these “foreign” dishes contain. Really enjoyed this recipe. Added lots of different veggies and to suite tastes I gave different options for topping (chopped nuts, sesame seeds, green onion). It was really yummy. This is going into my regular rotation! 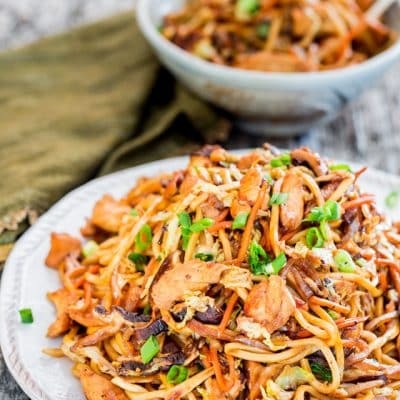 I ❤️ Lo Mein noodles and made this recipe for dinner, a few nights ago. It was delicious, and the fresh Ramen noodles I bought at a local Asian supermarket made all the difference! My g/f is a veggie and herb gardener and has been growing Bok Choy since the weather has turned cooler. I used Bok Choy in place of the Chinese cabbage and initially thought the gigantic head she brought home was way too much. But after trimming the stalks, chopping and washing the head, it turned out to be just the right amount. I did add more mushrooms than the recipe called for (a blend of Cremini and Shitakes), as well as some chili and garlic sauce (we like our Chinese food spicy) and the final product was SO DAMN GOOD! A great recipe — and so easy too! But every cook who likes Chinese food should keep OYSTER SAUCE (plus an extra bottle) in stock. Never mind running out of sugar or flour (that’s what neighbors are for) — there is NO substitute for oyster sauce! Don’t tell anyone, but I think Mr. Chang uses your recipe and makes big bucks. I made this last night – My dear husband and I loved it. The only change I made was using ground pork instead of chicken (he loves pork lo mein). In order to get the marinade that you used for the chicken to my ground pork I just added it at the last couple minutes when browning the pork. It worked out great. Thank you for the recipe! The Chicken Low Mein was delicious! I will try to tag a photo .